Two people were injured after a Maverick brand "flying car" crashed today in Marion County, Florida. Both reportedly escaped with minor injuries. The Maverick has been involved in at least two other accidents during testing, one in 2012 and another in 2013. "This homemade vehicle managed to make flight with two people inside but then crashed and caught fire," an email to the Orlando Sentinel from the Marion County Sheriff's Office said. The car was originally misidentified as an Aeromobil flying car when the Marion County Sheriff's Office sent out a photo of the Slovakian vehicle, seen below. The correct version of the flying car is the Maverick, seen above. The Maverick was developed by a Christian missionary organization in Florida called I-TEC, led by Steve Saint. Back in 2012, Saint was injured in a test of his "flying car," though it's unclear if he was among the injured today. The missionary group built the Maverick flying vehicle with the goal of reaching areas of the developing world more quickly. 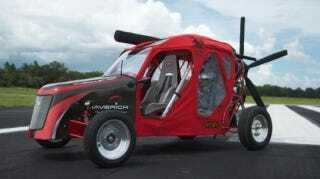 The flying car is also available for purchase to the broader public for $94,000. Below, a photo of the Maverick flying car in mid-air during what we can assume was a safer flight. In related news, we're still waiting on a safe, dependable, affordable flying car to become a mainstream success.